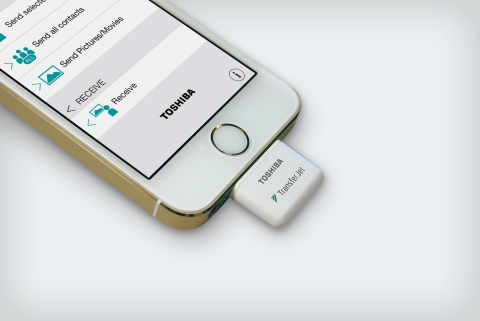 Toshiba Corporation today announced the launch of “TJM35420LT”, the industry’s first*1TransferJet adapter for iOS*2 devices such as the iPhone, iPad and iPod that is compliant with TransferJet close proximity wireless transfer technology. Sales of the adapter by mass marketers and online stores are scheduled to start from spring 2015 in Japan, followed by Europe, the Americas and Asia. TransferJet is a close proximity wireless transfer technology standard promoted by the TransferJet Consortium. The technology provides simple connections and ultra-high speed data transfers with low power consumption, and works simply by bringing the two devices in the transfer into close proximity. Maximum data throughput is 375Mbps*3, and 100 MBytes of data can be transmitted in approximately three seconds. 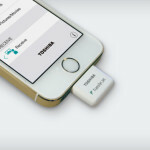 Users can use TransferJet after attaching the adapter to an iPhone, iPad or iPod with a Lightning connector and downloading the iOS app from the App Store. The adapter provides high speed file transfer throughput for large data sources, including movies and pictures. Users simply select the data file to be transferred on the screen of a mobile device and then “touch” the device against the receiving device. 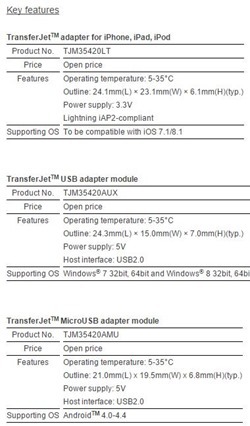 In parallel, Toshiba has also launched a 2nd generation USB adapter “TJM35420AUX” for the Windows® OS, and a MicroUSB adapter module “TJM35420AMU” for the AndroidTM OS, that are compliant with TransferJetTM, with sales scheduled to start in the first quarter of 2015. The new adapters for the Android and Windows® OS offer a 1.7 times faster transfer rate, 30% lower power consumption and 30% less volume than Toshiba’s previous models*4. The new TransferJetTM adapters will be exhibited at the 2015 International Consumer Electronics Show (CES), to be held in Las Vegas from January 6. *1 As of Jan. 5, 2015, Toshiba survey. *2 To be compatible with iOS 7.1/8.1. *3 The data rates depend on the device and file size. Toshiba does not provide any guarantees with regard to the data rates. The maximum transfer rates depend on the various conditions of the Lightning and USB2.0 connections. Toshiba does not provide any guarantees with regard to the maximum transfer rates. *4 Compared with Toshiba’s previous models such as “TJM35420UX” and “TJM35420MU”. *TransferJetand TransferJet logos are licensed by the TransferJet Consortium. *iPhone, iPad, iPod, App Store and Lightning are trademarks of Apple Inc.
*IOS is a trademark or a registered trademark of Cisco in the U.S. and other countries and is used under license. *Windows is either a registered trademark or trademark of Microsoft Corporation in the United States and other countries.